Andrew Pengelly has produced a neat little book on the Constituents of Medicinal Plants. This publication fills a niche, because with the possible exception of Terry Willard’s Textbook of Advanced Herbology, (actually not that Advanced) there is nothing else available specifically on this subject at an introductory level. Excellent text books such as the recent Pharmacognosy, Phytochemistry, Medicinal Plants by Jean Bruneton – run to nearly a thousand pages and nearly $200.00 dollars. Pengelly’s book, is around 100 pages and costs less than twenty dollars. 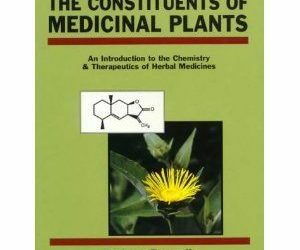 The book was developed from a course that Dr Pengelly teaches in Australia, and is clearly intended as a guide for students, both for those beginning more involved full time studies in medical herbalism, naturopathy etc, but equally useful for those whose herbal studies will not major on pharmacology of plant constituents. 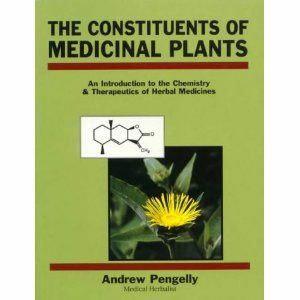 More importantly, Andrew Pengelly is a herbalist not a chemist; his perspective on plant constituents is wholistic, based upon understanding the contribution of constituents to the therapeutic effects of herbal remedies considered as whole plant actions. Let’s get clear about Pharmacognosy. Etymologically the term means “to know….the drug”. Medicinal plant material destined to be processed into herbal medicine is technically known as “crude drug”. So, historically, a pharmacognosist was someone who worked with “crude” herbs and spices , usually on behalf of manufacturers or buyers, in order to make sure the ID was correct, the quality was acceptable ie that contaminants were absent and so on. This involved an artful blend of several scientific disciplines, including fluency in both macroscopic and microscopic botanical morphology , extensive taxonomic knowledge, familiarity with effects of different habitats, seasons, ecology, harvesting and drying techniques upon the crude drug, organic chemistry as well as educated senses of taste, smell, and touch. Most of these skills are now deployed by those involved in the wildcrafting, cultivation and manufacture of herbal medicines, whilst the original pharmacognosists would probably find it hard to recognise their current heirs as legitimate offspring. Today pharmacognosy is for some more of a desk job, collating information about natural products, reviewing and compiling the huge amounts of research literature – perhaps the best example being the department run by Professor Farnsworth at the University of Chicago, Illinois, home of the huge electronic database NAPRALERT – a Really Useful resource for herbalists as well as natural product chemists. Natural product chemists, some of whom work in university pharmacognosy departments, may spend their whole research careers in a lab studying one small sub group of compounds, a far cry from the general skills of pharmacognosy as it was originally practiced. The usefulness of their work much depends on who is funding it, and equally upon ones point of view; much research is devoted to looking for compounds that can be exploited medicinally (ie financially), yet some of the work is undoubtedly Quite Useful. Unfortunately, some pharmacognosists have presumed that they are in a unique position make “scientific” pronouncements to the general public about the validity of herbal medicine based solely upon their knowledge of natural product chemistry and the pharmacology of isolated plant constituents. This is really Not At All Useful and tends to give modern pharmacognosy a tarnished image (as far as herbalists are concerned anyway). The historic inability of western herbalism to renew the vitalist underpinnings generated by the Eclectics and Physiomedicalists of the last century created a legacy of ambivalence and confusion – a theoretical and philosophical vacuum for which ultimately herbalists are responsible – in which the desire of herbalists to be seen as a legitimate “scientific” alternative medical modality tends to conflict with wholistic and vitalist views of the nature of herbs and herbal medicine. In practice today, the debate is no longer explicitly about “vitalism versus reductionist materialism” but reappears disguised in two related areas – the pharmacy of herbal medicines and the status accorded to pharmacological studies (experimental and clinical) of plant constituents. Arguments between different schools of thought about constituents consequently tend to set fur flying all round. A full account of these matters is properly the subject of a book not a book review – interested readers might refer to the seminal paper of the brilliant Eclectic pharmacist John Uri Lloyd, Quantity versus Quality (1922) to see just how little progress we have made since the last coherent period of vitalist pharmacy. This leads to a general, if minor, complaint about Andrew Pengelly’s book: although he stakes claim to wholistic territory in his introduction, he perhaps could have given more details of the therapeutic effects of the compounds described to back up this position. Whether one believes in “active principles” or whole plant” actions, at the end of the day the relevance of pharmacological knowledge for herbalists boils down to its usefulness in making remedy selection decisions. For example – tannins have classically been divided by chemists into condensed and hydrolysable varieties on the basis of their chemical properties. For the student of herbal medicine, the choice of tannin containing remedy for internal use will also depend largely upon whether the tannins are condensed or hydrolysable but because the latter exhibit a degree of both hepatic and nephrotoxicity compared to the former. Pengelly tends to omit discussion of such practical details of this kind. There is throughout the book a tendency toward brevity, which although a useful aid in presenting this complex subject, perhaps results in sacrificing relevant therapeutic information. Another example is the discussion of cardiac glycosides. Because of the all too well known discovery of William Wuthering, and the quite appropriate general prohibition of Digitalis for herbal dispensing today, even experienced practitioners tend to retain their novitiate paranoia about treating “serious” heart problems and avoid using any cardiac glycoside containing herbs such as Convallaria, although the specific pharmacological attributes of the Convallosides (distinct from the Digitalis family of glycosides) in fact render them exquisitely appropriate for treatment of chronic congestive heart failure. Classification of naturally occurring plant compounds conventionally tends to follow a number of schemes – none of which are wholly satisfactory for the herbalist more interested in therapeutics. Plant compounds are often sorted into groups by chemical structure, or according to the metabolic route which generates them such as the shikimic acid or mevalonate biosynthetic pathways. Pengelly uses these traditional schemes, which is fine up to a point. However, from the therapeutic point of view, these classifications ignore some of the herbalists best known constituent groups simply because compounds sharing certain medicinal properties crossover the chemists conventional borderlines. The classic example here is herbal “bitter principles” or plain “bitters”with their exemplary tonic action. Although some of the best known bitters are indeed secoiridoid glycosides, bitterness is a subjective quality, based upon taste, (betraying its origins in vitalist pharmacy) and many different plants and compounds share this quality. The outstanding modern western herbalist account of traditional pharmacology touching on these issues is to be found in Simon Mills’ book Out of the Earth. Given the brevity of Pengelly’s book, it is seems almost unreasonable to make nit-picking comments. There are no overwhelming or glaring errors, the primary problems are inevitably those of omission although a few familiar old chestnuts are reproduced such as the “immuno-stimulant properties of Inulin” (an often repeated assertion in books for which there is to my knowledge no particular substantiation) . If I had to select a couple of personal gripes they would be firstly the very limited discussion of essential fatty acids, their distribution and clinical importance. The fact they are not secondary metabolites as such is hardly a justification for cursory treatment – herbs and nutrition should not be forcibly separated. Secondly – given the overwhelming interest in and importance of flavonoid pharmacology, my own preference would be to pull these compounds out of “glycosides” and “phenols” and treat them more extensively as a group on their own. A brief and simple introduction to the pharmacokinetics and metabolism of herbal remedy constituents would also have been useful. Finally, the first edition apparently suffered from a rather poor final proof-reading of both text and chemical formulae. Some hasty errata slips and even a sticker have amended the latter – the former will hopefully be corrected in a second edition. These remarks should not however detract from the usefulness of this book. It is refreshingly unpretentious, affordable, clearly laid out, and provides a handy introduction to an area which is notoriously awkward to teach. The references are carefully chosen to guide the interested student gently into more in depth material without overwhelming with detail. Teachers of herbal classes and faculty in related courses will be glad to recommend it to their students.